Sure taxi's in Hong Kong are cheap, but why sit in traffic when you can easily see the entire city using the safe, efficient, and cheap transit system? Once you get your bearings, you'll see how easy Hong Kong's transit system is to navigate. You'll be able to explore even more of the food, fashion, and culture the city has to offer in just a short period of time. The first thing you need to know is Hong Kong has a combination of transit methods including, subway (MTR), trams, buses, and ferries. Hong Kong is divided by a harbor and has a lot of hills and mountains, so the ferry and trams play a large role in connecting neighborhoods. The second thing you need to know is the Octopus card—Hong Kong's contactless payment system that will work on all of the above methods of transport. No, not the delicious sea creature, the Octopus card is Hong Kong's contactless payment system, and it makes transportation throughout the city-state so much easier. It's accepted at all methods of public transportation (some ferries, taxis, and private-minibuses excluded), fast-food restaurants and even some shops. You can get your Octopus card at any MTR station (including the Airport Express), and it costs just HK$150 (HK$100 deposit + a minimum starter credit of HK$50). When entering the subway you'll see gates with pads and digital screens, to use your Octopus card you simply wait for the reader to display a green light, hold your card over the pad, and wait for your remaining balance to be displayed on the screen. When the fare has been automatically deducted from your card, the gates will open, and you can make your way to your ferry, train or platform. The Octopus card is refillable, so when you run out of credit you'll need to locate an "Add Value Machine" which you can find inside any MTR. To refill, insert your card in the machine, choose your method of payment, the amount you want to deposit, and insert your credit card or cash payment. Your card will hold a maximum of HK$1000 (around $130 USD), and if at the end of your trip you've got a balance under HK$500, you can take it into one of the MTR stations and get a refund, minus a small service fee. The Mass Transit Railway (MTR) is Hong Kong's subway system—the fastest, most common way to get around. 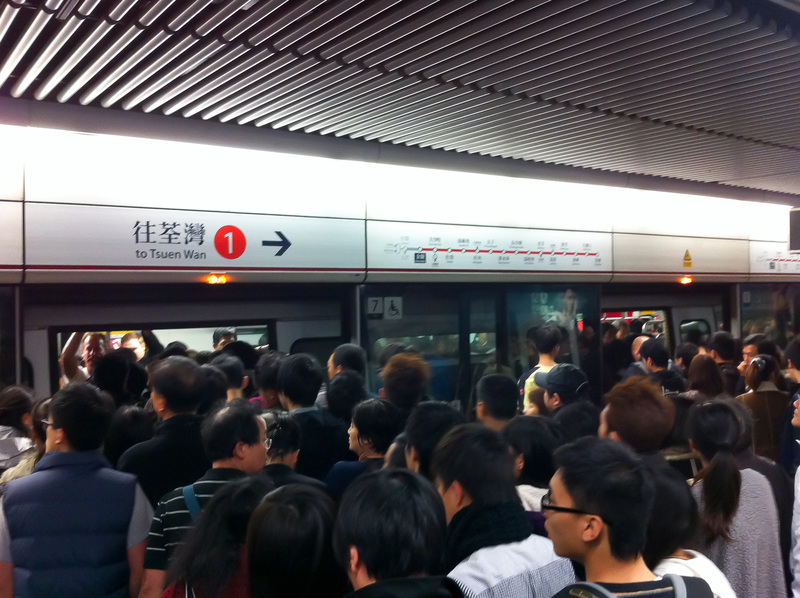 The MTR is clean, efficient, and one of the world’s best run public transit facilities. Using a map is easy, each station is clearly marked in a white circle, and inter-line transfer points are marked with an oval. The MTR has 11 lines that are named and color coded. Even though this sounds complicated, the stations are all named after the districts in which they serve (e.g. Looking for an address in Jordan? Try Jordan station), and most lines have little of interest for anyone other then a commuter. The most used lines are the Tsuen Wan Line (red) and the Island Line (blue). The red goes from Hong Kong Island and crosses underneath Victoria harbor with stops in Tsim Tsa Tsui, Jordan, and Mong Kok most notably, while the blue cuts across Hong Kong Island and has Hong Kong, Central, Admiralty, and Causeway Bay of interest. Trains run every day of the week, and start at 6am and last train runs around midnight, but change by line. So double check if you plan on traveling early or late. Fares are based on distance traveled and outlined in an impossibly large chart. Do yourself a favor and just get the darn Octopus card, it’ll do the math for you and make sure you aren’t over charged. Just tap the card to the reader when getting on, and tap when getting off the system. The maximum fare is HK$44 (~ US$6), but that will take you all the way to China (literally, it’s the fare to Lo Wu station, the border crossing at Shenzhen). Although the average fare you’ll pay kicking around is ~HK$10 (US$1.30). Hong Kong Island has a tram system that is cheap, fast, and environmentally friendly. The tall, double-deckered cars are run by Hong Kong Tramways, and are one of the city-state’s oldest methods of transportation. There are several routes, but most overlap to form a long path right across the the north of the island, with a loop serving Happy Valley. Trams run from 5am to midnight, with different routes starting and ending at slightly different times. The Peak Tram isn’t really a tram, it’s a funicular railway but “peak funicular railway” isn’t quite as catchy. It’s basically a tram that’s pulled by a cable from Central all the way up to Victoria Peak with a stop at the Mid-Levels. The tram offers up arguably the best view of the cities, and goes up at such a steep angle that the floors of the car had to be slanted to prevent you from feeling like you're being dragged up a hill in a sled (which you kind of are). The sloped floors provide a forced perception of gravity that makes you think you are upright, which also has one unintended effect—as you adjust to feeling upright the buildings appear to be falling, a slightly unnerving feeling that even regular riders are subject to. Since the tram is a bit expensive ($9.75 USD) locals who live at the Mid-Levels use the Automated Pedestrian Transportation to get around, this is basically a giant escalator that runs up the side of the Victoria Peak, it takes much longer but if you want to reach the peak on a budget, it's totally free. you can use the. Trains depart every 10-15 minutes and operate between 7am to Midnight, open every day including holidays. Return tickets are HK$75 (US$9.75). Despite Hong Kong being well served by rail and road, boats and ferries remain a popular method of transportation, and the only method to some of the smaller outlying islands. The are several operators, but most charge only couple of Hong Kong dollars higher or lower than the other, and provide similar service. The Star Ferry is by far the most used ferry service, and offers two routes connecting Hong Kong island with Kowloon. The shortish trip is 8-20 minutes depending on traffic (yeah, boat traffic), water conditions, and weather. Evening routes tend to be a little slower than daytime. The Tsim Sha Tsui Star Ferry Terminal on Kowloon has departures (and returns) to Hong Kong via the Wan Chai Star Ferry Terminal on the east side of the island, and the Central Star Ferry Terminal on the west side. Hours of operation are 6:30am to 11pm. Most of the larger ferries accept your Octopus card, adult fare is HK$2.50 one-way Mon-Fri, and HK$3.50 one-way on the weekend and holidays. Most of the city state is covered in bus routes operated by 7 private operators. While the MTR serves the majority or Hong Kong's attractions very well, however, if you are trekking to the south or to Lantau the buses are particularly useful. All the buses have digital screens that announce each stop in both Chinese and English so riding the bus as a tourist isn't at all intimidating. The bus system runs 24 hours so if you need to get somewhere really early or late, the bus is going to be your best bet. Fares can be paid by Octopus, and vary by distance traveled (starting at HK$2 and going up to HK$44). Since Hong Kong is separated by a harbor, walking between a few neighborhoods works great, but if you plan on covering a lot of ground you'll likely have to venture on to the transit at some point. You're best bet is to get your Octopus card as soon as you get to Hong Kong, and dive in to see just how easy getting around the city can be.